Nuts a no-no when it comes to dogs! Dog owners, beware of rewarding your four-legged companion with a variety of salty treats in the form of nuts. As much as we love to share things with our dogs, you may be doing them more harm than good by offering some types of nuts. Nuts are one more "DO NOT EAT" item to add to Fido's list of toxic or harmful substances. Two of the most popular online searches for pet owners is 'nuts and dogs' and 'are peanuts safe for dogs'. Dry-roasted peanuts, removed from their shells, are the best for dogs, not the one's that we humans prefer - the salted ones, as these contain far more sodium than your dog needs and, if ingested in large quantities, can be harmful to their health. Just like people, some dogs can be allergic to nuts, and some dogs can be allergic peanut butter. Allergies can show immediately and be in various degrees. The skin normally shows a reaction to the allergiin, such as redness and bumps/swelling of skin, and most commonly found under the front legs, between the toes, or clustered around the face and groin. ​In fact, certain types of nuts can cause toxic poisonings, an upset stomach or an obstruction in your dog's gastrointestinal tract which can lead to life-saving surgery and unexpected veterinary expenses. Walnut poisoning is one of the most common claims for toxic ingestion. Keep your pet safe and make sure the nuts listed below are out of your dog's reach. Dogs love the taste of almonds, particularly the flavored variety (jalapeno, barbecued, smoked, vanilla, cinnamon, etc.). While not toxic, almonds are not easily digested can give your dog an upset stomach and create gastric intestinal distress. Black walnuts contains a toxin called juglone which can cause a vascular disease in horses known as laminitis, but doesn't appear to cause problems in dogs. Eating black walnuts can cause gastric intestinal upset or an obstruction. In addition, moldy black walnuts can contain tremorgenic mycotoxins which can cause seizures or neurological symptoms. English walnuts can cause gastric intestinal upset (tummy ache) or even an obstruction in your dog's body. Like black and Japanese walnuts, moldy English walnuts can contain tremorgenic mycotoxins (toxic chemical products produced by fungi) which can cause seizures or neurological symptoms. Hickory nuts also contain the toxin juglone that can cause laminitis in horses. ​Eating hickory nuts can cause the same problems associated with black walnuts: gastric intestinal upset or an intestinal obstruction. Like walnuts, moldy hickory nuts can contain tremorgenic mycotoxins which can cause seizures or neurological symptoms. Japanese walnuts contain no toxicity; however, they can cause gastric intestinal upset or even an obstruction. Like English walnuts, moldy Japanese walnuts can contain tremorgenic mycotoxins which can cause seizures or neurological symptoms. Macadamia nuts are very rich in fat which can give your dog a major upset stomach and may cause pancreatitis. In addition, these nuts are reported to contain an unknown toxic principle that may result in neurological symptoms. Pecans also contain the toxin juglone that can cause laminitis in horses. Feeding dogs pecans can cause gastric intestinal upset or an obstruction. Like walnuts, moldy pecans can contain tremorgenic mycotoxins which can cause seizures or neurological symptoms. 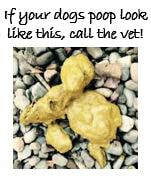 ​This topic is a rather unpleasant but important one: assessing your dog's poop for signs of a health problem. Since our canine companions can't tell us when they have cramps, a tummy ache, or some other digestive upset, it's up to us to stay alert for signs of trouble. Every noticed very tiny little black spots like soot on your dogs coat? If you have, read this!